Leaves of three, let it be...or else you're screwed.Legendary trios are important to the Pokemon structure. They provide mythological depth, stuff to do in the game, and great material for series such as this. Concepts for the different generations of trios vary wildly, from mythology and legends to basic concepts of humanity and nature. Legendary trios are also unique in that, in the anime, there are confirmed to be more than one of most members of legendary trios. Despite this, they have godlike powers, like all legendaries, that make them revered and omnipitent in the Pokemon world. Starting with generation 3, the idea of two trios was introduced, with Rayquaza being considered the equal to Groudon and Kyogre. This continued with Dialga, Palkia, and Giratina in gen 4, and in the upcoming gen 5 with Reshiram, Zekrom, and Kyurem. Some also consider Mewtwo, Deoxys, and Genosect as a trio, due to the fact that those three are legendaries not directly created by Arceus as gods, but are sort of pseudo-legendaries with legendary-level powers. So today we're just looking at the main trios from each generation. As has been noted before in one of Acciolove's Pokefact articles, these three birds are linked through their names. Articuno, Zapdos, and Moltres contain the Spanish words for one, two, and three, respectively; uno, dos, tres. But enough about stuff you probably already knew, that's not why we're here. 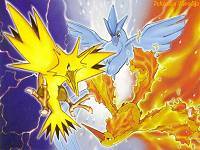 These three Pokemon are all based on birds of great power from different mythologies. Articuno is based on the Arab Anka myth of the Roc, a giant arctic bird of prey. Zapdos is primarally based on the native American thunderbird, a great, intelligent bird thought of as the spirit of thunder, who would act as a messenger for gods and spirits. Another, physical influence is the Impundulu, or lightning bird, a south African myth based on an actual bird, which was said to come into existence where ever lightning struck. Moltres is slightly more vauge. While obviously based on some sort of Pheonix or firebird, the more exact kind is hard to pinpoint. It is most likely based on the Persian Pheonix known as the Simurgh, or the Slavic Firebird. Other firey birds of note are the Japanese Suzaku(also known as the guardian of the south), and the chinese Sun Crow. The legendary dogs of generation 2 Are directly tied into the mythology of Johto, and more spesifically that of Ecruteak city. When the Brass Tower was set on fire, three Pokemon were found dead in its basement after the fire had been extinguished. However, Ho-oh descended from the Bell tower and ressurected them, reincarnating them as these three Pokemon, which would lay dormant until your character in the games comes in and wakes them up, 150 years later. This trio has signifigance to the plot in the concepts behind them. 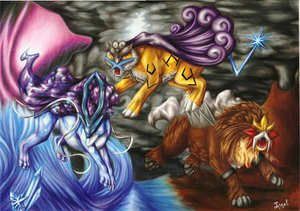 Raikou embodies the lightning that struck the Brass Tower, Entei embodies the fire that tore through it, and Suicune embodies the rainstorm that eventually extinguished the flames. Raikou is based on the Japanese Raiju myth. The Raiju is a demon said to take the form of a cat, weasel, tiger, or wolf, and its body is made of lightning or fire. (possibly a link to Raikou's storm cloud "cape") Raiju, while calm and harmless during pleasant weather, would become agitated and wrathful during thunderstorms, and leaps through trees and fields, and even sometimes cities. Trees stuck by lightning are said to be scratched by Raiju's claws. Entei's basis isn't as mythological as Raikou's. Entei is based on both real lions and Chinese guardian lions, also known as Lions of Foo. Lions of Foo are idylic representations of lions said to have magical protective powers. Statues of Lions of Foo are commonly found outside older buildings and temples in China. There are always two statues, one male, playing with a ball, and one female, playing with a lion cub. The three parts of Entei's faceplate can be thought of as an erupting volcano, with the silver part being the actual volcano and the gold and red parts being the explosion of lava. Suicune is hard to place in terms of it's animal basis. This, however, is in direct ties with its mythological basis, which is the Asian Qilin, a kind of Chimera not unlike a unicorn. Like the Qilin, Suicune's most likely animal basis are on deer, girraffes, and some kinds of dog, possibly wolves. Suicune's ability to purify water comes from the Qilin's kindness towards nature. The Qilin is said to be able to step on grass without trampling a single blade, walk on water, and be carefull never to harm any human or animal. As you can probably tell by their simmilar designs, these three Pokemon are much more unified in their concepts, all three deriving from the golems of Hebrew legend. 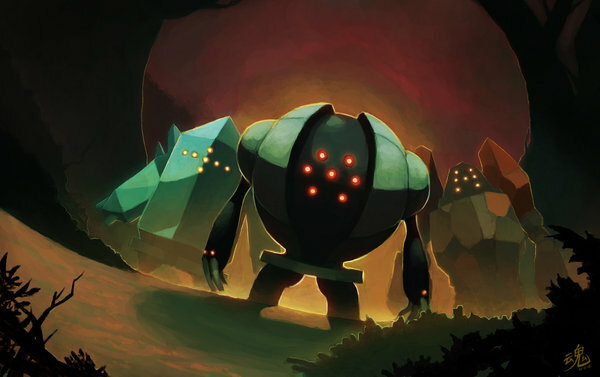 Golems were defined as living animate(moving) beings made of inanimate substances, such as wood, dirt, or clay. It was said that the way to activate a golem, and possibly gain control over it, was to have some sort of ecstatic experience involved with certain letters of the hebrew alphabet. Others claim control could be achieved by writing a spesific series of letters on paper and placing the paper in the mouth of an unactivated golem. Either of these legends could explain the use of braile in relation to awekening these three Pokemon. Golems are also often portrayed as having hebrew letters written on their heads that keep them animate, simmilar to the dots on this trios' faces. Also worth noting is that the types of these three Pokemon may be based on the ice, stone, and iron ages, all very important ages in history. 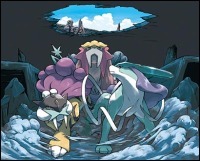 Regigigas, the "leader" of these three, may be based on the Mezezoic era. This is because Regigigas is said to have moved continents into place, and the event of continents seperating and moving occured a great deal during Mezezoic times. The lake trio is considered more godlike than the other trios, because of their origin and close ties to Dialga, Palkia, and Arceus. The lake trio emodies three basic human traits: Wisom(Uxie), willpower(Azelf), and emotion(Mesprit). These three are partially based on faries, elves, and pixies, and also have basis from the Imperial Regalia of Japan. Also known as the three treasures of Japan, the imperial regalia are three sacred items only allowed to be seen by the high royalty, and so no photos or drawings of these items exist. However, we do know that the three items are the Kusanagi blade, a sword said to embody valor and courage, the Yata no Kagami, a mirror said to embody honesty and wisdom, and the Yasakani no Magatama, a jewel said to embody emotion and benevolence. One other interesting thing to note is that this trio each shares a significant trait with the Abrahamic God, seen in Islam, Christianity, and Judaism. Uxie is omniscient, Azelf is omnipotent, and Mesprit is omnipresent. This could be linked to the lake trio's ties to Arceus. As we look into the near future, we see generation 5's new trio, which delves into completely new territory for concepts in general. 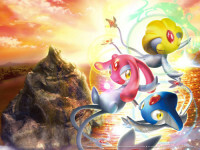 Generation 5 also introduces a third trio, in the three genie-like legendaries. As I've stated before, I won't be covering anything related to Black and White until I've played them myself, but rest assured there will be an article dedicated solely to the new legendary Pokemon once the new games see global release. this is IatosHaunted, signing off until next time.